Stacey Abrams gives her supporters a pep talk at an early vote rally in DeKalb County, Ga.
Stacey Evans (left) and Stacey Abrams (right), the two candidates running for governor in the Georgia Democratic primary on May 22. They have plenty of similarities: they're both women named Stacey; they're both former legislators in the Georgia House of Representatives; they're both lawyers; and they're both calling for similar progressive policies, such as expanding Medicaid. Stacey Evans thanks her supporters at a party to celebrate her 40th birthday. The two candidates running for governor in the Georgia Democratic primary on May 22 have plenty of similarities: they're both women named Stacey; they're both former legislators in the Georgia House of Representatives; they're both lawyers; and they're both calling for similar progressive policies, such as expanding Medicaid. But Stacey Abrams is black. And Stacey Evans is white. The color of their skin is the most obvious, if not superficial, difference between the two women. And it's led to a racialized campaign full of competing strategies on how you win. No Democrat has won a gubernatorial or U.S. senate race in Georgia in more than a decade. For some context, in 2014, both the Democratic gubernatorial nominee Jason Carter and the Democratic nominee for U.S. Senate Michelle Nunn lost by about 200,000 votes. So the question is — how does a Democrat in 2018 find those additional 200,000 votes? For all their similarities — that is where Evans and Abrams diverge. Stacey Abrams launched her campaign in Albany, a city in southwest Georgia where nearly three-quarters of the residents are black. It was symbolic. She believes Democrats keep losing statewide elections because they're too focused on winning over moderate white Republicans. "Political analysts keep looking at not only what the structure of Georgia is, but they're also looking at the playbook that was used in Georgia, and that's an old playbook," said Abrams. "It's an old playbook that never invested in any of these communities of color in Georgia." Abrams is convinced the only way a Democrat can win is by engaging with untapped minority voters, particularly those in rural communities, who've often been overlooked. She says it's not about excluding the Democratic base of white progressives, but broadening the coalition. "My campaign is about ... both those who are traditional Democratic voters and those voices who will be Democratic if we ask them to speak up," she said after a recent campaign stop in Marietta, Ga. But her opponent Stacey Evans has a different strategy. She, too, says the party needs to dig deep into its base and reach out more to rural voters, but she's also committed to converting disaffected moderate Republicans. "I want to go into the suburbs of Georgia and talk to moderate voters about why progressive policies like restoring tuition-free technical college ... will not just help individual families, but will help our economy," she said during a debate on Georgia Public Broadcasting. "And I know that when we do that we will get votes." Evans points to her own family as proof. 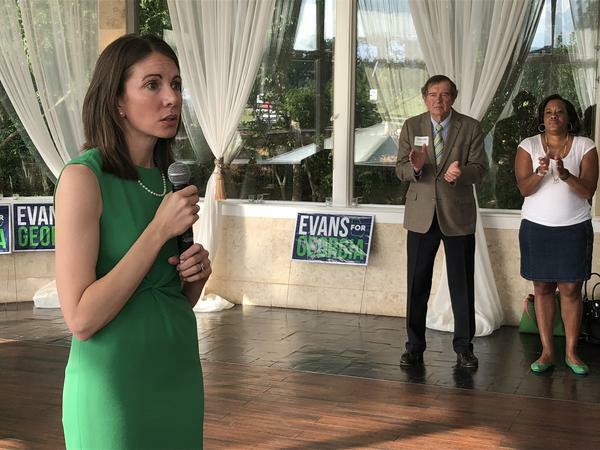 "My mom voted for Trump," Evans told the local NBC affiliate. "And I feel like she did it out of desperation. She felt like nobody was speaking to her." Her supporters insist she has a better shot at beating any Republican candidate in the fall. "I think she's the one who's most likely to draw on more moderate voters of either Republican or Democratic types," said Jessica Orvis, munching on hors d'oeuvres at a party in Atlanta to celebrate Evans' 40th birthday. In addition to courting moderate Republicans and independents, Evans has begun attacking Abrams for not being sufficiently progressive. Abrams has received the endorsement of national groups, such as Emily's List and Planned Parenthood, in addition to an endorsement from Vermont Sen. Bernie Sanders. But surrogates for Evans are trying to delegitimize those endorsements by highlighting that they're coming from out-of-staters who are unfamiliar with Georgia politics. Evans' main criticism of Abrams is that she gutted the HOPE scholarship — a generous program created in the early '90s that essentially offered students free college tuition. Evans says cuts to the program disproportionately hurt black high school students. She's been running an ad on TV that says 97 percent of African-American high school graduates lost access to full scholarships because of the deal Abrams struck with Republicans when she was minority leader in the Georgia House of Representatives. 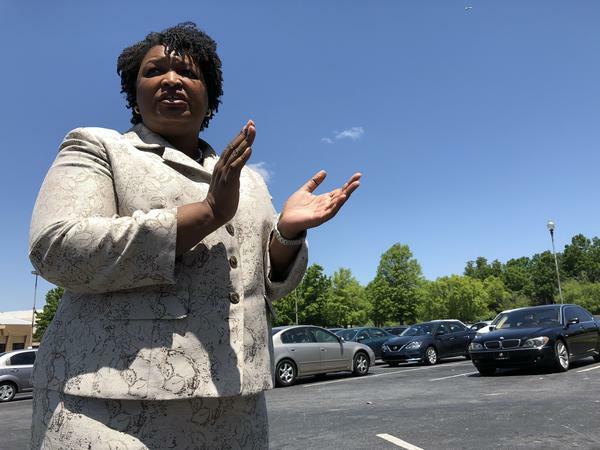 It's an effective attack; three times in two days, black voters on the campaign trail asked Abrams about it. Gary Morgan was one of those voters. He stopped Abrams in a shopping mall parking lot. "You voted for that?" he asked more as an accusation than a question. "Because otherwise nobody would have gotten anything," Abrams told him. "The Republicans wanted us to eliminate any student getting the HOPE scholarship who didn't pass a standardized test." Abrams and her supporters say as House minority leader she had to compromise with Republicans to avoid worse cutbacks. Abrams spends about six minutes walking Morgan through her decision step-by-step and by the end of the conversation he is convinced, and he's pulling money out of his wallet to donate to her campaign. But before he walks away, he also offers her some advice. "We don't vote for just black people as much as white people would like to think that," Morgan told Abrams. "We vote for which one is really gonna represent us. You gotta show that she's a hypocrite, because she's got a strong ad against you and it's damning to our community." It's overly simplistic to say this election is about race. But race is in the atmosphere. Last year, Abrams' supporters shouted down Evans at the annual Netroots Nation Conference chanting "trust black women." And more recently, Evans was criticized for a video that showed her face blending into Martin Luther King Jr. Whether intentional or not, some voters have slipped into racially coded language. One white voter, for example, said that she was supporting Evans in part because she had better "manners" than Abrams. 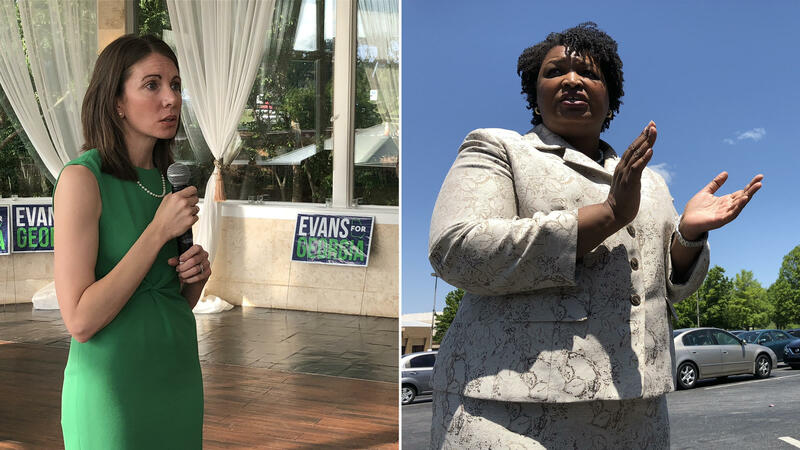 But Abrams — the black candidate — certainly has white supporters; just as Evans — the white candidate — has a number of black supporters, including well-known surrogates in the Atlanta political scene, like progressive former state Sen. Vincent Fort. "Let's just be real, and I'm gonna say something Stacey [Evans] could never say," said Lisa Cunningham, an African-American supporter of Evans. "I'm from Georgia, Stacey Abrams cannot win the state of Georgia. Period." She said "the elephant in the room" was skin color. "An African-American person of her stature cannot today win in the state of Georgia in the general election," she said. Cunningham said she also has reservations about Abrams record on the HOPE scholarship. But Abrams' supporters point to her experience and credentials. She was the state house minority leader for seven years. "She has the experience," said Barbara White, an Abrams supporter in the crowd for a campaign event in Cobb County. "She's been in in politics for a long time, and she's for the people." Abrams has a double digit lead in the polls, but many voters say they're still undecided. The reality is whichever Stacey wins the Democratic primary, her strategy — whichever strategy it is — will face a big test in November's general election because Georgia is still a state that consistently elects Republican candidates statewide.